MOSCOW, September 22. /TASS/. 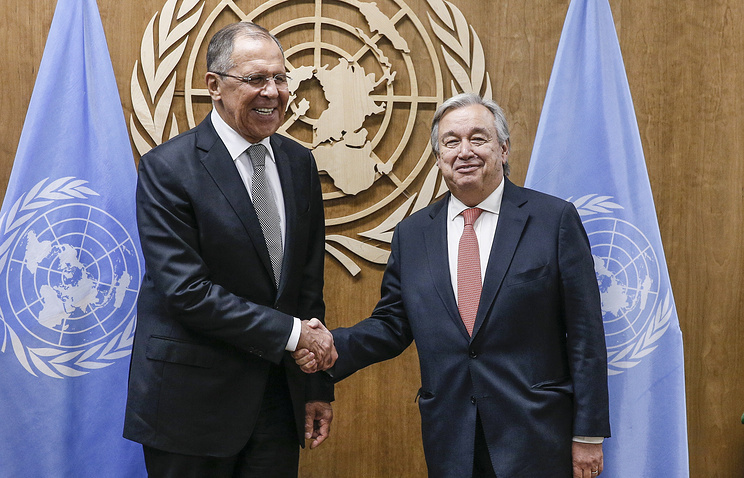 Russian Foreign Minister Sergey Lavrov has clarified Moscow’s initiative on deploying a UN mission to Donbass at a meeting with UN Secretary General Antonio Guterres, held on the sidelines of the UN General Assembly, the Russian Foreign Ministry said in a statement. "There was an exchange of views on the current agenda of the UN General Assembly and Security Council," the statement reads. "The focus was on the situations in Ukraine, Syria and North Korea. 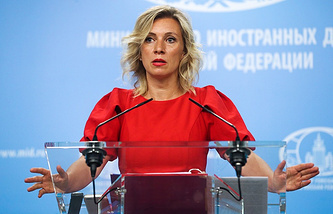 In particular, upon the request of the other party, Lavrov provided the details of the Russian initiative on deploying a UN mission to ensure the security of the OSCE Special Monitoring Mission in southeast Ukraine," the Russian Foreign Ministry added. The Russian top diplomat and the UN secretary general also discussed the political settlement of the Syrian crisis and ways to resolve the nuclear issue of the Korean Peninsula, "saying that military solutions to the crisis were unacceptable." Lavrov and Guterres paid special attention to the United Nations reform. "Lavrov spoke out in favor of reforming the United Nations, provided that the prerogatives of member states are not watered down, a comprehensive discussion is held and intergovernmental consultations take place at every stage while implementing the general secretary’s reform initiative," the Russian Foreign Ministry said. On September 5, Russian President Vladimir Putin handed instructions to the Foreign Ministry to submit a draft resolution to the United Nations Security Council, stipulating the deployment of UN peacekeepers to Donbass in order to ensure the OSCE mission members’ security. Putin pointed out that the deployment of the UN forces would become possible only after the weapons withdrawal process completed and the issue was agreed on with the self-proclaimed Donbass republics. The Russian president said that the deployment of the UN forces could help resolve the Ukrainian issue. On September 11, in a telephone conversation with German Chancellor Angela Merkel, Putin agreed it might be possible to deploy UN peacekeepers not only along the line of contact in Donbass. The Russian-drafted resolution concerning the UN mission to Ukraine is currently under consideration at the UN Security Council. Russia’s Permanent Representative to the United Nations Vasily Nebenzya told TASS on Sunday that after the first discussion of the document, the Ukrainian and US delegations said they were not ready to work on it. At the same time, Ukraine is likely to submit its own draft resolution to the UN Security Council.